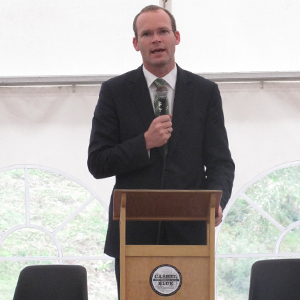 Yesterday, I was delighted to attend the official opening of the Cashel Blue Dairy at Beechmount Farm, Fethard, Co. Tipperary opened by Simon Coveney, Minister for Agriculture, Marine and Food. It was an amazing event and what was more amazing as I travelled through the lush pastures of Tipperary hidden behind mature beech trees on a quiet country road is this fantastic facility producing a world-class product, a real live model of how modern agriculture should be in Ireland. 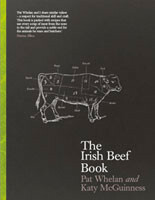 There gathered in front of the dairy, surrounded by what must have been 150 of the finest dairy cows in Ireland, were the great and the good of the Irish food scene both locally and nationally. I was delighted to see so many of our local Tipperary food producers, coming to share this very proud day with the Grubb family. It was great to hear Louis Grubb recall the early days of Cashel Blue, while it seems to some that 1984 was a long time ago, to me it only seems like yesterday. For those of you who don’t know, or have never heard of Cashel Blue cheese, which I don’t believe there is anyone, it all sprung from Jane Grubb’s passion for creating Ireland’s first blue cheese. The process was very basic at first with single batches of the cheese being made from the fresh cows milk on the farm. Once the product was made Louis and Jane Grubb began selling in the local country markets. 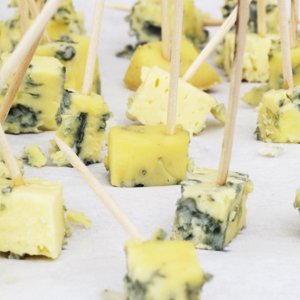 Within a couple of years, production of Cashel Blue cheese increased with the building of their first on site dairy. This enabled the Grubb family to export to countries throughout the world including the US, UK and Australia. With popularity growing for this niche product both nationally and internationally the plan was made to invest in a state of the art dairy that would enable large scale production of both Cashel Blue and Crozier Blue (a blue cheese made from sheep’s milk). 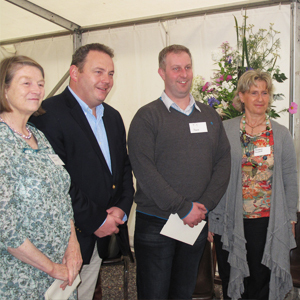 Yesterday marked the official opening of Cashel Blue cheese new state of the art dairy. Speaking at the event the Minister Coveney hailed the Grubb family as a model business which started selling to local country markets in 1984 and now export their famous Cashel Blue cheese to thousands of customers all over the world. The dairy is located on the grounds of the Grubb family’s home in the heart land of the Tipperary countryside. The company currently employs a team of 20 staff, all of whom live within 15 miles of the factory which shows the Grubbs commitment to keep jobs in the community.